LaTasha Massey worked hard to own her Iowa City house. A community projects specialist for Johnson County with a master’s degree in social work from the University of Iowa, she received assistance from a city-run, state-funded program to help with her down payment. 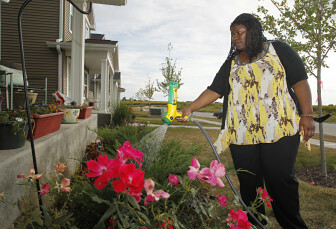 LaTasha Massey waters flowers in her front yard on Sept. 11, in Iowa City. 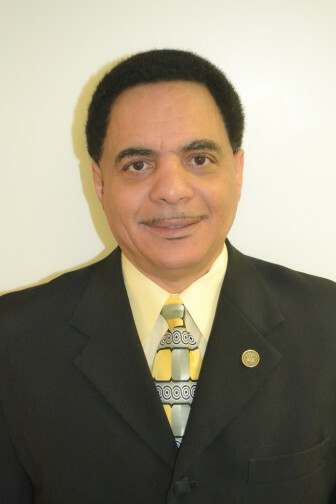 Massey moved into the house in December 2012, participating in a city-run, state-funded program providing down payment assistance to potential home buyers who meet income guidelines. Yet, despite her job and college degrees, she had difficulty. She first sought places to rent but ran into landlords who said they did not take Section 8 cases. How many kids do you have? she was asked, an assumption she believes they made because she is a black woman in her early 30s and was looking for housing. The questions fit what she hears in Iowa City, a university town more culturally diverse than other Iowa towns, about “those people” – code for black people coming from urban centers like Chicago to find subsidized housing, she said. “You become an outsider even though you’ve been here for years,” Massey, an Iowa City City High graduate, said. At least Massey’s advanced degree, good job and, now, home ownership put her ahead of the curve for most black Iowans, and also another growing minority group in the state, Latinos, an investigation by six news organizations revealed. That investigation showed that the gaps in education, income and housing among whites, blacks and Latinos in Iowa have grown worse over the last five decades. Gregg Hennigan of The Gazette (Cedar Rapids), Jermaine Pigee of The Hawk Eye (Burlington), Joe Sutter of the Fort Dodge Messenger and IowaWatch data analyst/staff reporter Lauren Mills contributed to this report. Stephen Gruber-Miller also did reporting for the West Liberty Index. White Iowans have made strong gains in high school and college graduation rates, lowering poverty levels, median family income and home ownership since 1960. But black and Latino achievements in these areas have grown far more slowly, or in some cases declined, contributing to a widening opportunity gap among the races. The reasons can be found in a blend of institutional racism, negative stereotypes of minorities in Iowa, limited support from the state, language barriers and immigrants’ lack of knowledge of U.S. culture, Iowans who deal with the disparity said in interviews. Those interviewed include African American and Latino residents and leaders, social workers, officials in government and law enforcement, and community leaders. They spoke for a special project, Iowa’s Opportunity Gap, a collaboration of IowaWatch; The Gazette, in Cedar Rapids and Iowa City; The Hawk Eye of Burlington; The Fort Dodge Messenger; the West Liberty Index; and the Colorado-based public service journalism organization I-News, which analyzed U.S. Census Bureau data from 1960 through 2010 and made them available for the project. “With this being the 50th anniversary of Martin Luther King’s speech, I think everybody would agree that race relations have come a very long way,” Charles Clayton, executive director of Athletics for Education and Success in Fort Dodge, said, referring to the Aug. 28 anniversary of King’s famous “I Have A Dream” speech. Iowa’s census numbers show the high school graduation rate doubling for whites to a little more than nine of every 10 getting diplomas. The rate for black Iowans has almost tripled, although to only a little more than eight of every 10 graduating from high school. The Latino rate has become dismal – half of the Latino youths were graduating from high school when the 2010 census was taken a few years after large immigration raids disrupted families and schooling in Iowa. Little improvement is seen when it comes to owning a home. Three of every four white Iowans owns one, up slightly from 1960. Half of the state’s Latinos and three of every 10 blacks owned a home in 2010. That is down from a peak in 1970 when an average exceeding three of every five Latinos and just shy of three of every five blacks owned homes. 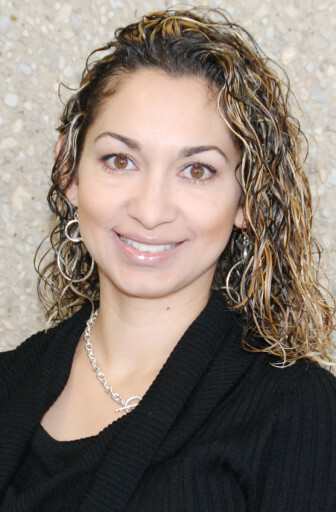 Joan Jaimes, an outreach counselor for Marshalltown Community College and secretary of the U.S. Council on Latino Affairs, said disparities among whites and Latinos in Iowa could be related to a rapidly growing immigrant population and more slowly increasing white population. A 2012 report by the State Data Center of Iowa showed the state’s Latino population almost doubled from 2000 to 2011, to a little more than 5 percent of Iowa’s population. Adjusting to the changing demographics will take some work for both immigrants and longtime Iowans. “It’s a question of learning what employers here need, but it’s also a question of educating the employers and the educators in the system here about how to accommodate to the growing population,” Jaimes said. Virgil Gooding, a therapist at Keys to Awareness in Cedar Rapids and a member of that city’s African American Family Preservation and Resource Committee, points to a 2011 Linn County Institutional Analysis, which was to examine racial disparities in child welfare. 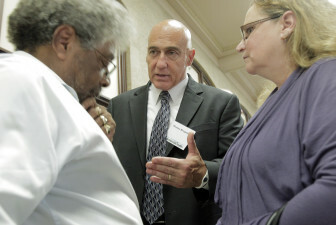 Virgil Gooding (left) and CJ Schmidt (right) speak with Cedar Rapids police chief candidate Thomas Bergamine of Fayetteville, NC, during a meet and greet with seven candidates for Cedar Rapids police chief on Aug. 23, 2012. Wayne Jerman was selected to be chief. “The Institutional Analysis found the same things that the various African American communities had been telling folks for years,” Gooding said. He is not convinced that racial attitudes in Iowa are improving. “What I have seen is racial attitudes have seemed to overtly change in one direction and covertly change in the other,” Gooding said. “In fact, we hear folks always talking about how things are getting better, but then we have these statistics. Now either the statistics are wrong, or that image that things are getting better is wrong. I tend to go with the statistics,” he said. “The issue here is that there’s never been an honest conversation about racial attitudes in this state and about the various institutions in the state regarding treatment of African American citizens,” he said. Virgil Gooding has more to say about a link he sees when it comes to opportunities black Iowans have for home ownership, higher income, jobs, and high school and college degrees. Read more about that here. Gooding said factors such as the effects of substance abuse, crime and mental health need to be part of the conversation when addressing racial attitudes and inequality in Iowa. The Rev. Shane McCampbell, a local pastor and member of the Burlington City Council, added poverty to the list. Latino high school graduation rates in Iowa peaked in 1990 at 64 percent, but in 2010 were down to 53 percent, significantly below the 2010 national Latino graduation rate of 62 percent. The black high school graduation rate in Iowa was 83 percent in 2010, 1 percentage point above the national average for blacks but still below the 92 percent white graduation rate in the state. Many community leaders trying to close the gap focus on education as the starting point. 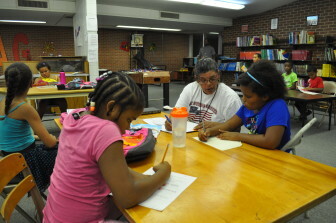 The Calvary Family Center in Fort Dodge tutors youngsters in math and reading. Most of the students were African Americans when Calvary Memorial Church of God in Christ’s pastor, the Rev. Leroy Johnson, helped launch the center in 2004 but children from all races attend now. The Fort Dodge public school district directs youths to the center and works with the center on programming. “We were trying to close that disparity gap and try to help, knowing that starting at a young age is – it’s more effective if you work with the kids and they get the fundamentals of reading,” Calvary Family Center Director Sharla Coleson said. Third graders Jaylynne McDonald (left), Amber Castor and Ayanna Foy work with Belia Hollingsworth during the AFES after-school program in Fort Dodge, Iowa. The kids spend the first 30 minutes working on homework or other projects, then have some STEM training followed by extracurriculars and free time. Black leaders said disproportionate contact with the criminal justice system affects the ability to succeed in school or get a good job. “You get that marijuana arrest on your record, that’s going to affect your future as far as employment, education and different opportunities are going to be cut off,” Dedric Doolin, clinical director for the Area Substance Abuse Council in Cedar Rapids and an NAACP board member there, said. Dave Selmon, of Burlington, has a criminal record and has served time for forgery, a felony. But he graduated recently from Southeastern Community College. He said young people need to see black people in a more positive light but also challenged black men to make sure they don’t defeat themselves, and, moreover, to be around as a father figure for their children. Iowa’s college graduation rates display a significant disparity as well. One of every four white Iowans in the 2010 census graduated college, one of every six African Americans and one of every 10 Latinos. All three rates are below national averages and the Latino rate is decreasing. The affordability of college can be a problem for Latinos, said Vanessa Marcano, a representative of Citizens for Community Improvement, a politically active group that advocates for stronger immigrant rights, among other causes. “They’re still working very low wage jobs so they have to work two or three so they don’t have time or they just cannot afford it,” she said. Complicating matters, undocumented Latinos cannot have access to any financial aid or any need scholarships. Robinson said Latinos are underused in the workforce no matter what their education. Struggling with English or having an accent can set up Latinos for menial jobs for which they are overqualified, she said. Des Moines Area Community College President Rob Denson sees a solution in an education appropriations bill, House File 604, that passed the Iowa Legislature this year. He said it will help train more Iowans, especially minorities, for employment. On June 20, Gov. Terry Branstad signed the bill into law, authorizing $5.5 million for adult education and literacy programs at community colleges and $15.3 million for the state’s workforce training and economic development funds. Robison was unconvinced that the money will be used effectively for educational purposes. “It looks like a great number, but a lot of that money is administrative fees,” she said. Doolin said recruiting people of color for jobs would help close the disparity gap because it could counter an image of Iowa being a place that puts people in prison at a higher percentage than any other state. The Cedar Rapids Police Department employs 203 officers. Three are African American and one is Latino. Iowa will lose potential workers if such disparities continue, Doolin said. “Your African American kids who are talented and knowledgeable and skillful often look to leave because they don’t want to deal with that,” he said. Poverty for Iowa’s minorities is growing. While the white poverty rate in Iowa has stayed near 11 percent for 40 years, the rate had increased by 2010 to 43 percent for African Americans and 27 percent for Latinos, the census data show. The poverty puts stress on emergency shelters. “A lot of the problem for African American and Hispanic families is they tend to have a lot more children and they just don’t tend to have the same support systems,” said Major Von R. Vandiver, commanding officer of the Salvation Army of Siouxland in Sioux City. Correspondingly, median family income and homeownership rates among blacks and Latinos are far lower than for whites in the state. The 2010 median family income for white Iowans was $62,423, while black families earned $26,760, less than half of what whites made. The median income of Latino families was $38,030. Median family income for whites in 2010 was 11 times higher than it was in 1960; it only five times higher for blacks and Latinos. The homeownership rates in Iowa in 2010 were 74 percent for whites, 31 percent for blacks and 51 percent for Latinos. Fifty years earlier 56 percent of black Iowans and 53 percent of Latinos in the state owned a home. That’s the case on the opposite side of the state in Columbus Junction, where the Tyson Foods meat packing plant employs 1,200 in a town of 1,900 residents. The town has a constant population of around 900 Latino residents but families often come and go, seeking new job opportunities. If they don’t stay they often move to other Iowa towns with a significant Latino population, Mallory Smith, at Columbus Junction’s Office of Community Development, said. West Liberty City Councilman Jose Zacarias said he tries to convince Latinos in his town, which is 52 percent Latino, to buy a house but they are reluctant. Some yearn to return to their original home, something Zacarias tries to counter by noting that the economy there is not as good as it is in the United States. “Some other people are just waiting for the immigration reform to pass, to come out and start doing things in the community,” Zacarias said. Robison added another twist: she said she has encountered Latinos who buy home with balloon payments they did not understand and which, ultimately, they cannot afford. “They signed on the dotted line, they turned over $15,000 in cash and then they did not realize at the end of the six months or 18 months they had to turn around and pay $100,000 or lose the home,” she said. Robison said Iowa has failed to create a welcoming environment for those who struggle with English by not hiring enough Spanish speakers. The Iowa Department of Transportation had been refusing to grant drivers licenses to DREAMers, the term for people younger than 30 brought into the United States illegally by their parents and who were exempted from deportation by the federal government in 2012. The DOT reversed its position in January, but not before creating ill-will among the Latino community. 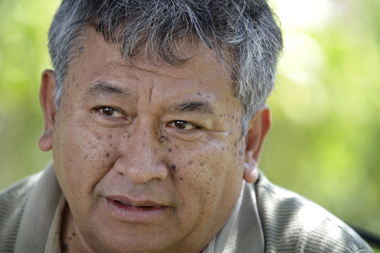 Finally, there’s that language barrier between Latino immigrants and long-time Iowans. It is a major hurdle but for Latinos, Jaimes said, immigration is worth it. “It may be difficult, but it would have been worse if they would have stayed wherever they were from,” Jaimes said. This IowaWatch collaboration with four Iowa newspapers, published in fall 2013, is particularly pertinent during the Martin Luther King Jr. Day holiday period. It tells you how and why gaps exist in home ownership, jobs and pay, education and crime exist among white, black and Latino Iowans.